At the 99 Steps Foundation, Darr the Afflicter is freaking out about the news that a microscopic Starro was inside of him. He asks what the thing is. Batman, on satellite monitor duty, gives him a detailed report, including how the Starro drones employ mind control to completely control the actions of the host body. The Starros appear to be the cause of the recent unrest and unruly mob behavior around the world, including the trouble at the City of the Future. The Justice League calls in Firestorm, to help investigate how Starro is spreading his influence around the world, and why some people seem immune. At that moment, Dr. Light and Green Lantern (John Stewart) start to behave in an agitated manner, as if they are Starro's latest victims. At the JLA satellite, Batman is doing some analysis. He remarks that the entire planet has been infested by microscopic Starro spores, and that social chaos is spreading as a result. He says the key to the solution is to attack the emotional instability of those infected. He further explains that the solution lies in finding a means of exerting enough emotional distress in an infected host to sever the Starro's control; and to do it on a planetary scale. Batman dons a "safe-suit" and activates the teleporter so he can initiate his plan. At Mamluk International in Hong Kong, Rughal, sworn enemy of The 99, is talking to Starro. He admits that he enjoys the chaos; and speaks of his partnership with the extraterrestrial being. Although Starro has tried and failed to conquer Earth before, Rughal feels he will ultimately succeed. In Brazil, Rafie the Lifter is flying next to Hawkman and explaining that he has the power to lift himself or other people and objects into the air, much like Hawkman's Nth metal. Fattah the Opener and Mumita the Destroyer join them in flight. They approach yet another young adult who now has a Noor stone and is just now manifesting his new abilities. They attempt to link with this new Noor stone wielder, who calls out to them for help, saying he cannot control his behavior and stop the earthquakes. At the City of the Future, Dr. Ramzi wants two of the members of The 99 to leave, but asks Samda the Invulnerable to stay. But first he asks Jabbar the Powerful, Noora the Light, and Samda the Invulnerable to combine their abilities and summon Fattah the Opener. As a result, back in Brazil, Fattah's Noor stone begins to glow. Fattah the Opener arrives but immediately requests the right to return to Brazil because the new Noor stone user is running wild. But Dr. Ramzi needs his services now. Since the 99 always works in carefully chosen groups of three, Dr. Ramzi wants Fattah to drop off Jabbar the Powerful and Noora the Light at the 99 Steps Foundation, and pick up two more members: Sami The Listener and Batina the Hidden. Dr. Ramzi wants Fattah to return immediately afterward, bringing the two additional members along. At Oolong Island, Batman hooks up with the Doom Patrol. He says he needs something from the island for his plan, to help stop the madness. At the 99 Steps Foundation, Jabbar and Noora are displeased to see that the erratic crowd behavior is getting worse. 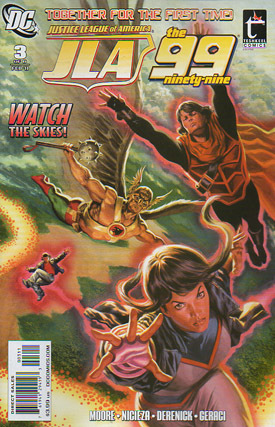 Firestorm arrives and generates a shield to block the energy beams from Dr. Light and Green Lantern, who are still being controlled. Firestorm's maneuver somehow causes Dr. Light and Green Lantern to pass out. One of the members says that the 99 must work in groups of three; but with Jabbar and Noora back, they have five, which only leaves enough for one triad. But Darr the Afflicter arrives, saying that with six, they now have two full triads. But suddenly Firestorm is behaving erratically; and then there is an explosion. Story - 1: This book, and the entire series, has the noble purpose of promoting positive values of peace, tolerance, cooperation, and unity in a troubled region of the world. I am rooting for this series to succeed. I discussed my feelings at length in my review of issue #1. I am guessing that these crossover stories are popular with regular readers of Teshkeel Comics, especially very young readers. I know that The 99 is very popular with its fan base. But since most Superman Homepage members are readers of DC Comics, not Teshkeel Comics, I feel obliged to focus my review from that perspective. And if you compare this comic with any recent issue of Justice League of America by James Robinson, the JLA/The 99 book just does not stack up. Not even close! In the regular Justice League book, Robinson is writing stories that are intelligent, thought-provoking, engaging, and multi-layered. He respects his readers, and leaves some plot details for the reader to figure out. His dialogue is natural, and his character interactions make sense. By comparison, this comic book is simplistic, unimaginative, and mundane. There is just not anything very interesting going on. The quality fell off a bit from last issue. Some story details did not make much sense to me. For example, we have a brief appearance from the Doom Patrol. But it was so one-dimensional, and they appeared in only a couple of panels; so a reader might be inclined to ask himself "What's the point?" If you are a regular reader of Teshkeel Comics, not DC, you know nothing more about the Doom Patrol than you did before, except for text at the bottom of the page that describes them as "offbeat heroes". Also, when Firestorm blocks an attack from Dr. Light and Green Lantern, they immediately go unconscious. The only explanation we get is when Flash says they "are stunned". Nothing in the visuals suggests why this is so; and no further explanation is given. This storytelling can only be described as sloppy. I really hate to give such a poor rating; but I cannot in good conscience go higher. Art - 2: The artwork is rather cartoony. The DC heroes are all rendered accurately; but the artwork just does not "pop" for me. Cover Art - 3: The colors are a bit subdued. But Felipe Massafera does a nice job drawing the heroes, especially the faces. I want to see more of his work.